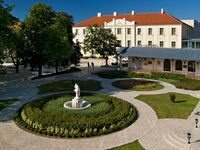 The four-star Anna Grand Hotel**** Wine & Vital building complex is located on the northern shore of Lake Balaton, a 100 meters away from the famous Tagore Promenade, in the middle of the historical district of Balatonfüred Füred Small Forest (with tennis courts all year long) on the north. The town of Balatonfüred successfully carried out the complex rehabilitation of the 19th century reform age inner city rich in historical relics using resources of the European Union. The Ipoly Residence wing is located in a120-year-old eclectic art relic building about 100 meters away from the main building, in a spectacular vicinity, about 50 meters from the shore of Lake Balaton, in the busiest part of the reform age district of Balatonfüred connected to the Memorial Park and the Tagore Promenade. The three-storey, non-smoking Ipoly Residence that is fully accessible for the disabled as well, evokes the milieu of discrete luxury with its spacious, carefully planned, various size bedrooms and apartments partly with terrace perfectly ideal for relaxation. 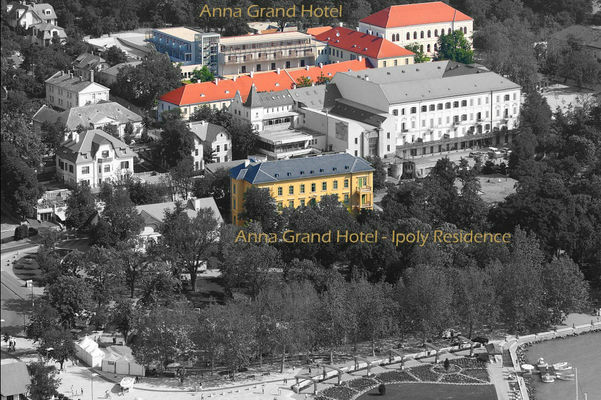 Anna Grand Hotel ensures comfort to her guests with a 100 different type and size rooms in a more than 200-yearold classicist building. Our suites and executive rooms are located 100 meters away from the main building at the 120-year-old art relic building of Ipoly Residence. There are 8 different size designer suites and 6 executive double rooms waiting for those who seek perfect relaxation. Our 1200 m2 wellness department awaits our dear guests with a flat surface swimming pool, a 22 x 5 meter freeform pool, jacuzzi, Finnish sauna, infrasauna and vapour bath. and Finnish sauna covered with cedar beside the whirlpool. contribute to the exclusive experience of refreshing and renewal at Anna Grand Spa. We kindly recommend the 4-alley bowling alley, the 420-square-meter Vivamus wine shop, the BioMed cure center with a holistic therapy program and the indoor garage with 150 parking lots. Our hotel ball room gives home to the elegant and world-famous Anna Ball that has been organized since 1825. The elegant, more than 200-year-old restaurant was reconstructed in accordance with the style of its original age in 2006. This is the venue of the Anna-Balls. It is worth tasting a dessert from our confectionary that offers homemade cakes following 19th century refom age recipes, ice-cream, chocolate fondue and classic confectionary products. • Breakfast is included in room rates. • Half board is available at 6600 HUF per person. • Full board is available at 12100 HUF per person. • All inclusive board is available at 16300 HUF per person. • Wired Internet access is available in all rooms. • Wireless Internet access is available in the lobby. • The hotel's own parking lot is available for the guests at 1200 HUF per car per day. • Garage is available for guests at 2100 HUF per car per day. • The hotel is not wheelchair accessible. • Children under 6 stay free in their parents' room. • No pets are allowed. This hotel has specified its room rates in Hungarian Forint (HUF) and will confirm your booking in this currency. If you select another currency the rates will be converted for your convenience. Please note that this conversion is approximate and may differ from what you will actually pay because of exchange rate fluctuations. • Rates exclude tourist tax (500 HUF per person per night). • No tourist tax is to be paid for persons under 18. • The hotel accepts Hungarian vacation checks. • Total payment must be completed on arrival.